For the last 5 years of living up here I have driven past this stretch of road on 414 between Blackwell and Cedar Run. It is called the narrows by everyone around here with good reason. But one thing always gets me...exactly who went through the guard rail in two places and did they drop the 200 feet down to the creek? This "guard rail" is more like some wild ride to your death rail and needs fixing and the narrows need widening. Passing any large vehicle on this road especially at this spot is a religious experience. I hope no one important has to die before this road hazard is fixed. Mountain Girl, Paula, praying for a miracle on 414. For the first time in over 30 years the pond is full. We received enough rain last night to take the pond from 1' deep to 8' deep. After a summer of drought Pine creek is up to 4.5 feet and rising as well. If everything holds during the winter there might be a little ice skating at Camp Eaglebear this winter. Mountain Girl, Paula, reporting from Leetonia. "The kids in the truck were pretty drunk. They wrecked about 4 or so, and were able to get out through the back window. They got themselves to the bank and slept I guess until it was light. They saw Hershey camp, walked up there and no one was there. They then walked out the lane and out onto Beulahland road and our place was the first place they saw, and they knocked on our door about 7:30. They said they were stuck in a ditch somewhere, didn't even know where it was, and didn't want us to call for them to get help. One called his mother and Fred took them out to 414 where they walked towards Jersey Shore. When they got up to 414, they saw where they went over, and told Fred that's where it was. We walked up the trail a little later, and saw where the truck was, and then called George who set the wheels in motion. Two of the kids were in the ER when we talked to the driver of the truck and his family while they were trying to get the truck out. One had a broken wrist, that's what he said he knew was wrong with him. Don't know about the other guy, didn't see much of him. He only had a couple scratches. They were really lucky. The state police found a lot of unopened beer in the truck and I'm sure there will be lots of fines, etc involved. Nothing further to report. Don't know if it made the paper or not." Thanks alot Clare for the information, Mountain Girl, Paula, Logging out! Whoops forgot to make the turn. After a night of drinking and plently of fog this truck didn't make the turn on Beaulahland Road just up from Cedar Run. Thanks to Fred and Clare Gost who live close to this site for getting the pictures. Second hand information claims the truck contained four people. They went over about 4am and walked out to get help around 7am when they could see where they were. Lucky for them it was a warm in the 40's night not like last night when we went to 10 degrees. to pull the vehicle up the hill it got almost to the top and the cable broke dropping the truck back down and adding more damage. They then decided to go down the bike trail to reach the vehicle and had to roll the vehicle end over end to get it out. Guess it didn't look too good after they got it out. I heard the victims had at least one broken arm and some cuts and bruises no word as to anything more serious. I guess they had a alcohol angel watching over them keeping them from being killed. Welcome to the woods boys next time think before you drink! Mountain girl, Paula, logging out. Thanksgiving is all about spending time with family and we were blessed with having my brother, Rob, come up to spend the holiday with us. 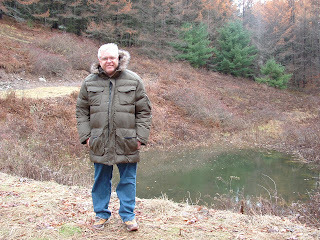 There he is standing in front of the pond. 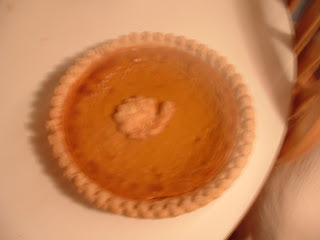 Of course the next most important thing food, which we had a lot of including the pumpkin pie. happened to four people on Beulahland Road, just about a half mile up from town at the first sharp turn. The road turned and they didn't. They spent the night up there with their empty beer cans and had to be hoisted out this morning. Please don't drive after you drink up here these roads are hard enough to drive sober. Fortunately, no fatalities. Well, I hear my brother snoring after dinner so it must have been good. You all have a great Thanksgiving. Yesterday, the snow started covering everything with a beautiful blanket of interesting designs. I particularly liked the way the snow clung to the roll of fencing. By the end of the evening we were without power for the night. Spending time talking in the glow of kerosene latrines. Without bright light it is difficult to do much but talk and so bedtime came early with the hope of power in the morning. At 5 am the power came back and I opened the door to 6 inches of snow outside. Working on a roof today will be a difficult job of shoveling. I am hoping my tarp held most of the snow back so we have a clean surface to start the day. This is the time of year being a carpenter is not looked at with envy by the outside world. Wish me luck it is off to work I go. Well, 7 month old Scooter got his first taste of snow this morning. There was just enough snow for a good bite and he decided it tasted just like a snow cone. The picture also answered the question can you find a white dog in the snow? The answer, "Yes, if you put a orange collar on them." I don't think he will show up as well in a snow storm. me wonder how I can be so mesmerized by something so simple. The same thing happens when you live in the city, yet, somehow the quiet background of the forest allows you to focus on the small mysteries. The snow is wet as it is very close to the freezing temps. The animals track will show up well in the white fluff and it will be fun to see what animals have walked across the snow when we walk up the hill. It is like having detective dusting powder to track down intruders, only these intruders live here. There has been a rash of red wine theft from local taverns and State Stores. There has been much speculation as to who has been causing this increased theft a mere few days before bear season. 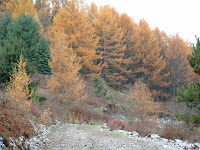 When we first moved up here full-time and I saw the pine-like larches turning yellow and their needles falling off, I thought they were dieing. Since then I have learned not all of the pine tree keep their needles all year long. 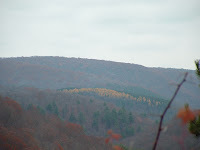 The Larches are some of the last splashes of yellow we see across the mountain before the gray sets in. Then the evergreen pines hold a solitary pose over the grays and white snows of winter. On a day the sun is shining the yellows are more vibrant then today's overcast view. Looking at this million dollar view everyday reminds me that living in a place where financial rewards and business opportunity is limited is worth it when it feeds the heart. Loving living in Leetonia, Mountain Girl Paula, logging out! 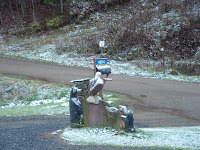 Well this morning I awoke to a light dusting of snow on the eagle and the bear. It is a reminder that winter is just around the corner even though we have had so many unseasonably warm days. The mud is bad to the north of us since the logging trucks have been mucking up and down the road and the combination of rain and cooler temperature don't allow the road to dry out. Caution should be exercised coming down hill especially as the clay is very slippery. Now is the time I feel pressured to get everything outside done before the snow makes it hard to work and move up and down the road. This year they are plowing the road from the Galeton side to our house. This has caused various degrees of responses. We are happy to have one access point that won't require a snowmobile, but most of my work is the other direction in Slate Run to drive around is about 50 miles one way. So going to Slate Run will still require the snowmobile and won't allow people to come up from the south without one. 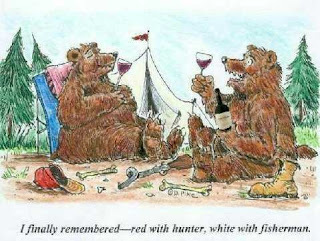 The hunting season is about to start full boar with Bear Season Monday-Wednesday....not my favorite time, since I name the bears, I hate to see them shot. Deer follows the day after Thanksgiving and most of the camps will be hopping. I am sure I will catch some of you up here. I will be working to get some of my jobs covered so I have a place to work this winter. The nights have gone cold into the low 20's but during the day we are still warming up to nice 50's and even some 60's. This morning I was greeted by some Evening Grosbeaks enjoying the sunflower seeds on the front stone pillars. They are shockingly colorful for this time of year when most of the colorful birds have flown South. This is truly part of the joy of living in Leetonia... seeing the interesting birds and animals. Some of whom are on their way to other places...some who stay all year. We are busy or should I say Lee has been busy stacking the firewood next to the house for winter. It is nice to have it a short walk out onto one of the two porches when you are daily feeding the fireplace to stay warm. It looks like the cost of fuel is going to make having wood to burn a real money saver this year. I just filled some gas cans at Galeton today at $3.08/gal. I can only imagine what they are going to charge us to fill the propane tank this year. The other advantage of wood is you can get warmer the closer you set to it. After working outside all day coming into a wood-warmed house has a sedative effect. A little food and a warm fire will knock you out fast. Here is a shout out to the Holden Family who visited Leetonia for the first time and stayed at the Bonitz Camp. They learned a little Leetonia History and I think perhaps realized this little ghost town has much to offer and learn about. They are already talking about the next time they can come stay. Once you are bitten by the Lure of Leetonia it is hard to stay away. Although we have seen a few fleeting snowflakes already nothing that you could call snow has fallen and I am happy to let it wait for a while this year. Mountain Girl, Paula, logging out!